Local Beach Info : Croyde Surf Hire - Surfboard, Wetsuit and Equipment Hire, Croyde Bay. Croyde Beach is famous far and wide as one of the best surfing beaches in the UK. It's unique geography means that it is something of a "wave magnet" and there is often a surfable wave here when everywhere else is flat. 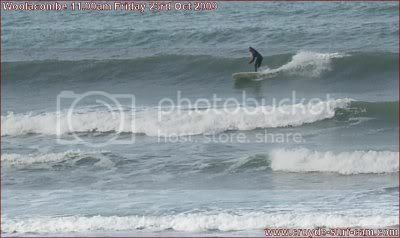 With the right conditions the waves at Croyde can be world class. The beach itself is very picturesque, a three quarters mile crescent of golden sand framed by green headlands. In the summer months the beach is patrolled by RNLI Lifeguards (from Easter until late October..approx). 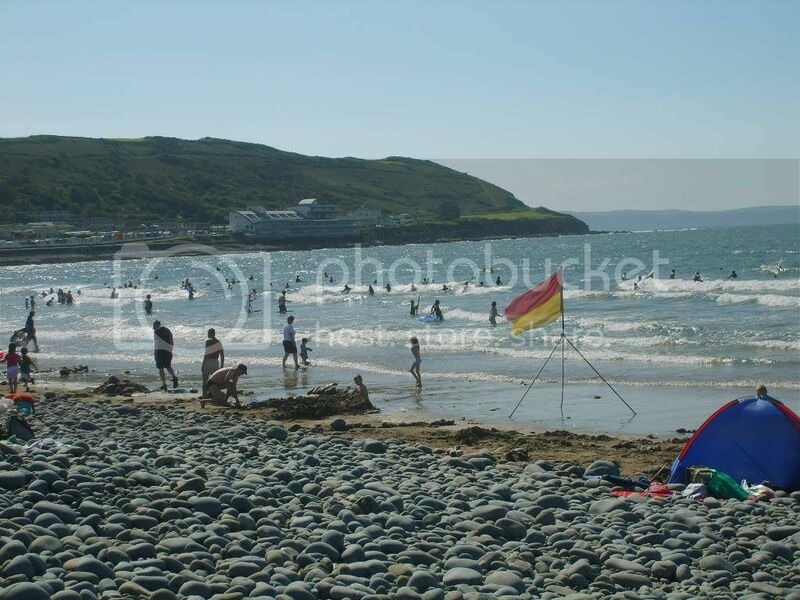 Croyde Beach is also used by several Surf Schools and it can become crowded especially during School holiday periods. This isn't such a problem as it's a just short hop over the hill to Putsborough Beach in one direction or Saunton Sands in the other and these are both several miles long! We are very happy to advise our customers on the wind/tide/swell conditions in order to get the most out of their trip! 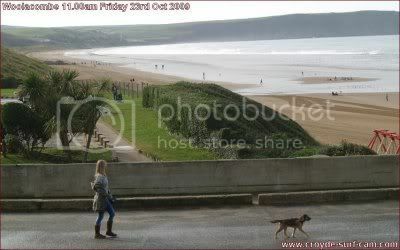 Putsborough is a fabulous beach with three miles of golden sands that run all the way across to Woolacombe. There is only one access road which runs through Croyde (there is no direct access from the Woolacombe end). We are the nearest surf shop. Putsborough Beach has a slight northwest aspect which combined with the high cliffs of Baggy Point give it shelter from the prevailing Southwesterly winds. This means that it is often possible to find good surfing conditions here when all other North Devon beaches are choppy and not at their best. This combined with it's natural beauty make Putsborough a very popular surfing destination. There is a large carpark and an excellent beach cafe, with miles of sand, overcrowding is not normally a problem. Putsborough Beach itself is gently shelving which can make the waves a lot more managable. The size of the surf is greatly effected by the tide however. Even in big swell conditions Putsborough is generally pretty small at low tide. As the tide comes in the surf gets bigger.. at high tide it's fairly similar in size to all the other beaches. As soon as the tide starts to receed the size starts to drop again. This tidal size difference means that you can often find small ridable waves here at low tide even in southwesterly winter storm conditions however if Croyde is small and choppy there is little point in checking Putsborough except just before high tide.. but many still do! We are constantly amazed by the amount of people who come to Croyde and never discover Putsborough.. until we tell them about it! As ever we are happy to advise our customers on the wind/tide/swell conditions in order to find the best surf! Saunton is yet another fantastic beach. Stretching over 3 miles to Crow Point, it is a vast stretch of sand, so vast in fact the RAF occassionally practice landing Hercules Transport Planes at the far end! There are also three square miles of dunes (biggest in terms of area in the whole of Europe). 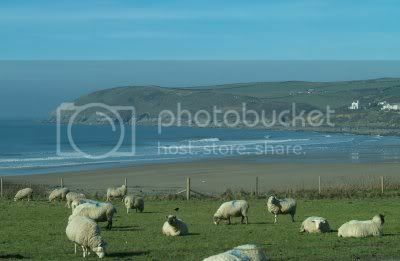 Saunton has been used in many TV and film productions. (Video for Robbie Williams song "Angels" for example). Surfwise, Saunton is the capital of Longboarding for North Devon, maybe even the whole country! Being so flat the waves roll in slowly, the gentle gradient allowing them to start a lot further out than elsewhere. This particularly suits a long 9ft plus surfboard with lots of planeing area. The slower waves and size of the beach means that it is a great place for beginners to catch some forgiving crowd free waves. 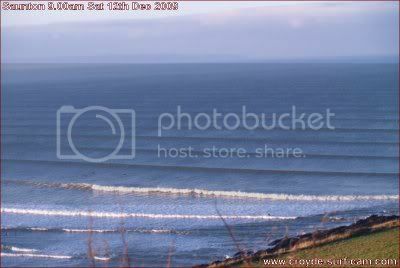 The size of the surf at Saunton is largely uneffected by the outgoing tide so in very small conditions when Croyde is flat on the outgoing tide there is still often a small Longboardable wave at Saunton. The main Croyde road runs past Saunton high on the cliff and there are several lay-bys offering a fantastic view of the beach, Hartland Point and Lundy Island. This cliff also gives some shelter from northwesterly winds, especially at high tide but this is sketchy unless the wind is very northerly. Due to our close proximity to Saunton we now hire Longboards, both Custom and Epoxy. Woolacombe Beach is another stunning sandy beach stetching nearly three miles to Putsborough at the far end. There is no direct road between the two as such so you have to drive around the Downs behind (only about 3 miles). The beach is very popular with families and every year hosts a fiercly competitive Sandcastle building competition. The northern end has rocky inlets, some of which are joined to the main beach at low tide but all of which become separate bays as the tide comes in. 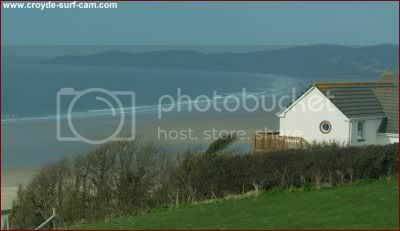 The waves themselves are a cross between Croyde and Saunton however often a little smaller. The main beach is good for beginners and is RNLI Lifeguard patrolled (in season). The northern inlets of Barricane, Combesgate and Grunta offer more variety but require a little more experience and local knowledge to surf safely. Westward Ho! (the only placename in the UK which ends in an exclamation mark!) The beach itself is a sandy stretch of about 2 miles backed with a pebble ridge which has a large car park behind. This is the only sandy beach listed here on the southside of the Taw Estuary (you can see it from Saunton if you look across to the other side of the river). Getting there from the other beaches used to involve crawling through Barnstaple traffic however the new Downstream Bridge has eased the journey and shortened the trip. Westward Ho! is a good sandy family/beginners beach fairly similar in characteristics to Saunton although the waves are usually smaller due to it being in the lee of Hartland Point. Experienced Surfers tend to use Westward Ho! as a starting off point to explore further down the rocky coast towards Cornwall. There are other spots in the area. Some are obvious as they can be seen from the road, some that require an intimate local knowledge of wind/tide/swell direction and some that require large swell and a jet ski. These spots are for people who are experienced surfers who respect (and gain the respect) of local surfers.